Hmmm...sounds really great and the cover is beautiful! Nice pick! waaaaaaaant this book. when i first stumbled on it, i saw the cover, gaped, and said "WANT!" it looks so good; i hope it lives up to it! 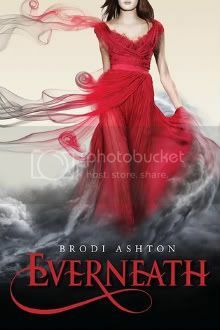 ooo Everneath! I can't wait for this one either :D thanks for stopping by and following. I'm following you back! Ooh I've seen this one somewhere! It definitely sparks my interest! Although I might wait for some reviews before deciding to get it! Not only does the book sound great, but the cover is beautiful! I'm another one waiting for Everneath! I'm currently having a giveaway as well if you're interested! Just scroll down a bit from my WOW. I'm totally with you on the cover! WOW, it's striking! !